Velddrif is a small fishing village found along the West Coast of South Africa. It is located on an estuary, where the Berg River meets the sea at St Helena Bay. Having been considered a 'forgotten about' seaside town, it has, in recent years, become a popular holiday destination for those seeking refuge from the hubbub of Cape Town. While the area is predominantly rural, boasting very few shopping centres and business complexes, it is one of the few places in the country where time comes to a standstill and is seemingly irrelevant. Without the hustle and busy of commercial living, visitors are able to unwind and relax, paying attention to only the sounds of the crashing waves, the seascape and the howling wind. The name of the village came into being after Theunis Smit; a local farmer took his stock through a drift in the veld in order to find grazing areas across the river. Cattle and other farm animals were expected to swim across the river, an inconvenience which resulted in unnecessary drownings. A 'pont' was constructed in 1899 as a preventative measure, and at the time, acted as the only crossing point. Today, the Carinus Bridge now grants the residents of Velddrif access to various areas in the Cape and vice versa. Fishing, tourism and salt production are central to the village's economy. Two large salt deposits, which can be found nearby, produce much of the salt in the Western Cape. It is also home to a thriving fishing industry where species of galjoen, West Coast steenbras, shad and snoek are found in abundance. Laaiplek, seemingly indistinguishable from Velddrif, lies on the outskirts of the village. It derives its name from the function it serves; it is a harbour where fishermen offload their daily catches. The heart of Laaiplek is a hum of activity, where fishermen dock their trawlers to have their stock weighed before it is sold to various markets and fish shops. Visitors can sample a taste of 'Bokkem', a salted, dried-out fish that is a delicacy of the West Coast Region. Birdwatchers flock to Veldriff to spot many varietals that are indigenous to the area. Found midway between Laaiplek and Veldrif lies the Berg River Estuary. 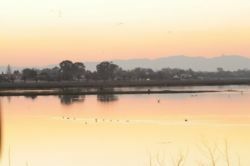 It is here where as many as many 200 species of bird are found, including the chestnut-banded plover, little stint, and the curlew sandpiper. While a bird-lovers haven, visitors will also be amazed at the biodiversity, with the estuary harbouring an array of diverse habitats. 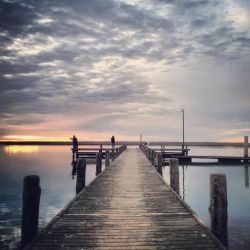 Velddrif makes for a tranquil breakaway, where you're able to sample the local cuisine while enjoying the natural scenery. Scattered around the quaint village are several holiday accommodation establishments - from luxury hotels that provide you with all the pampering you need to self-catering units. Travel further afield and you'll reach the West Coast National Park. While especially known for its bird life, visitors will be privy to the sights of numerous game and seasonal spring flowers. Wildlife includes large antelope such eland, bontebok, kudu and gemsbok. Furthermore, game-viewers are encouraged to keep their eyes' peeled for the shy away bat-eared fox. Between the months of August to October, the park will be transformed into a flower wonderland, where carpets upon carpets of vibrant Cape wildflowers can be seen from miles away. A quick look at our website will give you the information you need to make your choice. You will find reviews and you will also be able to compare prices and find wonderfully affordable accommodation in Velddrif. 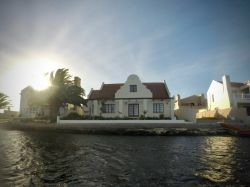 Are you planning the perfect getaway but have not yet found your ideal Velddrif accommodation? By using our easy website, you can find great accommodation of all types, whether it is a cosy bed and breakfast or a comfortable lodge. We have thousands of easy to find listings for self-catering facilities, holiday homes, guest houses and hotels as well as backpackers, chalets, caravan facilities, villas and apartments, giving you a wide variety of options when it comes to your accommodation in Velddrif. To help you find the right place to stay, we have a number of tools that you can use, including a map. This will help you to pin point exactly where you will be staying and it will show you the accommodation facilities that are closest to where you will be. Regardless of the reason for your visit to Velddrif, we can guarantee that you will find the type of accommodation you are looking for. 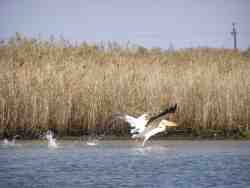 But reviews for Velddrif accommodation is not the only information you will find. Want to know if your Velddrif accommodation is pet-friendly or allows smoking? All of that information is included on the listings page. You will also be able to find which activities are on offer and the sort of amenities included with each room. All of this information will help you to make an informed decision before you make any payments to, giving you more peace of mind about your choice. 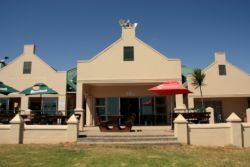 We include all of the contact details of the self-catering accommodation, holiday homes, guest houses and hotels as well as backpackers, chalets, caravan facilities, villas and apartments in Velddrif which are featured on this website, so you also have the option of getting directly in touch with the place. 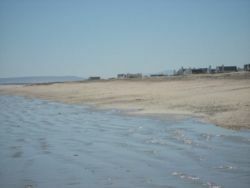 Regardless of where you are staying, we feature Velddrif accommodation in that area of the province. You have options of Velddrif guest houses, lodges and bed and breakfasts, among others, ranging from your more affordable, lower prices to your more luxurious options. So, you are not visiting for a holiday but rather for business and all you need is a place to stay for a night or two? The bed and breakfast options, as well as the lodges, are generally preferred by business people and you will find all types, from your more luxurious lodges to your simple, self-catering bed and breakfast. Each will give you a safe roof over your head while you are in the province. Velddrif accommodation is not only affordable but well situated. If you are doing business in this area, this is a great accommodation choice. Spending more than a few days in the province? Perhaps you are indulging in a tour of the region and you are looking for a few places to stay? Browsing through our listed self-catering accommodation, holiday homes, guest houses and hotels as well as backpackers, chalets, caravan facilities, villas and apartments in Velddrif will give you all of the information you need to make your selection. And once you have found the ideal place to stay, you can either request a quote or make your booking directly on this website. Sleeping-OUT.co.za is designed to make finding and booking accommodation in Velddrif easier than your traditional methods of sourcing a place to stay! We include some great accommodation special deals in and around Velddrif. 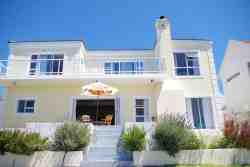 24 reviews of Velddrif Accommodation.